Sonewadi Village is located in Nashik district in sinnar tehsil near bhatghar dam on sinnar-akole road. Songad and Parvatgad are located behind this village. We can complete two forts in one day. Jilha parishad school in sonewadi is roadside. In front of school there is a cement road which leads to sonewadi. After walking for 5 mins we reach to a raw road. After crossing the road we reach the base of the hill. There are few houses on the hill so there are few steps to reach the hill. After climbing the steps for 5 mins we reach the top of the hill.After ascending the hill we reach on a large plateau. The hill on the right side of the large plateau is Parvatgad and on the left side is the Songad. The route leading to both the forts goes through the pass between the two forts. After walking for 15 min we reach at the pass between the two forts. The road on the left side of the hill leads us to the west side of the Songad. The road is through dense forest area after ascending for 15 min we reach ate the east side of the Songad. There are steps carved in the rock.After climbing the steps we reach at the base of the hat shaped Songad. There are steps carved on the hat shaped Songad. After ascending steps there is cactus trees on the left side of the steps there is water tank (Khamb Taak). After seeing the tank continue on the steps for ascending. There are stones of Samadhi on the right side of the steps. After climbing there are remains of tatbandi on the left side of the steps. The rock beneath the tatbandi is painted in white color. After this we enter in the fort through a destroyed entrance gate. After ascending few steps we reach on the top of the fort. There is a temple of khandoba painted in white color. There is water tank behind the khandoba temple. after walking for some time we reach at the west end of the fort. From this end we can see parvatgad , aad fort and Bhatghar Dharan on the left. 1 hour is required for reaching Songad from sonewadi. Since the perimeter of the fort is small it takers 30 min to explore the fort. 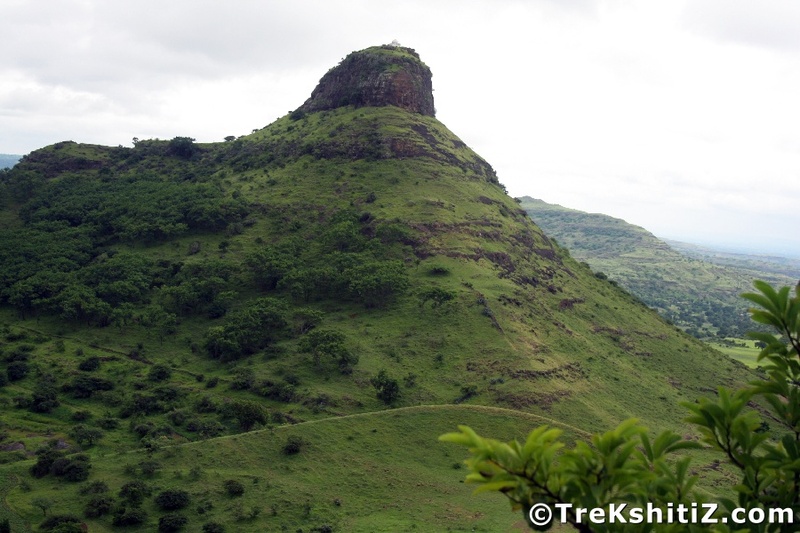 The base village of the Songad and Parvatgad is Sonewadi. To reach Sonewadi we first have to reach Sinnar from Mumbai. On Sinnar-Pune road there is a turn at 10 km for Gondewadi. This road is upto Akole. on this road Gondewadi-Dapur-Chapadgaon-Sonewadi distance is 16 Km. Sonewadi-Akole distance is 17 Km. Sinnar-Sonewadi distance is 23 Km. Sonewadi-Nashik distance is 53 Km. From Sinnar and Akole there are S.T. buses available at an interval of 30 mins. Jeeps are also available from Sinnar and Gondewadi towards Sonewadi. There are two ways to reach Songad from Sonewadi. 2) From the east side of the fort : a school is located at 2 km towards akole from sonewadi. The east ridge of the fort is near from the school. There is a darga behind the school. The road behind the darga leads us to the fort. There is no facility to stay on the fort. We can stay in the school located in the village.